The Lique’s (pronounced "Leak") crowd-funded debut album, “Democracy Manifest,” is the culmination of an 18 month journey together and the beginning of a multi-genre musical experience complete with a 4-piece band, spoken wordsmith, and a buoyant stage presence comprised of storytelling, fan interaction, and choreographed routines; all served with a suit and tie. The band’s history is deeply rooted in Las Vegas, by way of Rasar’s hometown of Sacramento, CA. 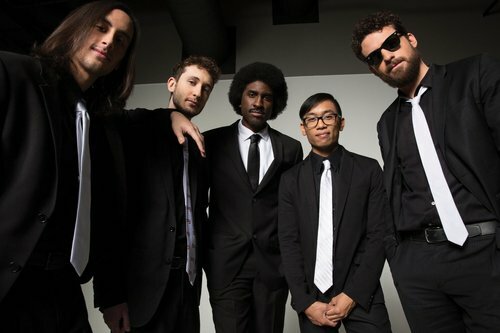 It was in Vegas where an impromptu jam session between Rasar (MC), Jason (Keys), Sean (Guitar), Nick (Bass), and Jeremy (Drums) would eventually lead to being recognized as one of the “10 Acts To Watch in 2016” by Las Vegas Weekly, a prominent national feature in “AFROPUNK” as well as being named “Best Band” by Vegas Seven Magazine. Join us in the ballroom for an awesome night of music, poetry, laughter and fun!